I was lucky enough to get one of the first pre-production prototypes of the Eagles Nest Outfitters (ENO) Atlas strap to review back in 2012, and since then I have really grown to love this style of hammock suspension (e.g., daisy chain loops with an integrated webbing strap). This is one of the few suspension systems that I recommend to new hangers, but I often take it out myself when I don’t want to fiddle with my über-light, but finicky hammock suspension systems. This is one of the few hammock suspension systems that has a permanent place in my gear closet. The Atlas hammock strap from Eagles Nest Outfitters is a pair of polyester webbing straps with sewn loops forming a daisy chain 9 ft (2.75 m) long. There are 15 loops, each is approximately 4 in (10 cm) long, but end about halfway up the strap. The side without the daisy chain has a single eye loop. This is the end that wraps around the tree/anchor point. 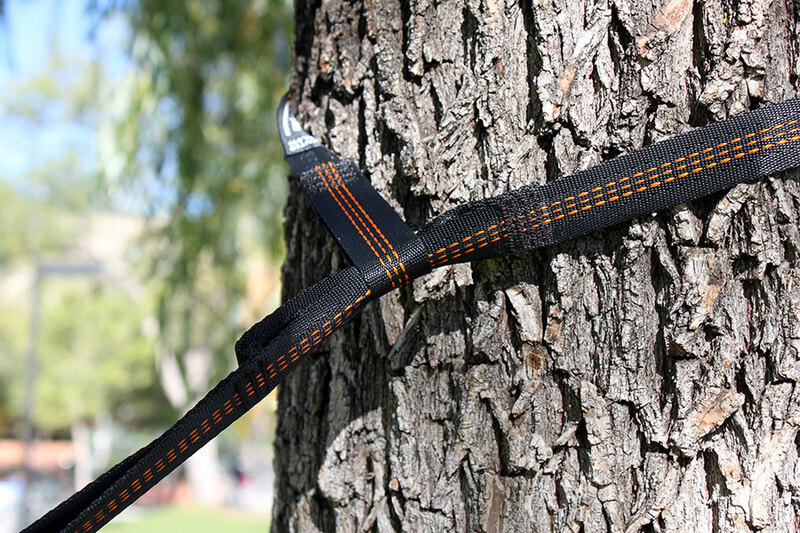 The hammock connects to the webbing loops via a climbing-rated carabiner or other load-bearing hardware device. Toggles can also be used. As I mentioned, the ENO Atlas strap is geared toward new hangers, occasional hammock campers, or those not too concerned about weight and bulk. I like to use it on gear demonstrations because it requires so little (if any) explanation and beginners pick it up quickly. These straps are dead-simple to use and understand. 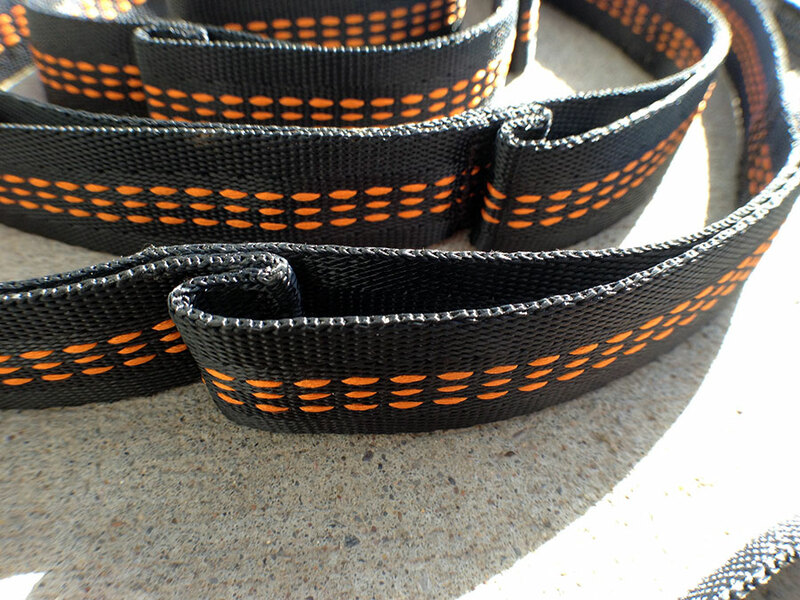 The main advantage of the Atlas strap, besides the quick attach points, is the material. ENO has been selling this style of daisy-chain hammock straps for years, but the Slap Strap models are made with stretch-prone nylon material. A lot of folks have expressed their love of the concept, but hated the execution. The Atlas strap, made with polyester, is an improvement in material, but I also like the slimmer build of the loops compared with the Slap Strap line. This helps the Atlas straps pack a little tighter in my pack. Weight limit 91 kg (200 lbs) per strap. I am pumped to upgrade! Ive been using slap straps for a few years, and couldn’t agree more about the stretch factor, its always frustrated me. Thanks for the review! Fantastic! I had a pair of Slap Straps too. The Atlas are a great upgrade I think you’ll enjoy. Added benifit: any extra strap acts as a drip line. Maybe you know, maybe you don’t, but what kind of stitch is used to make each loop and how is it done? I am trying to make my own. I have a set of these but I need one more set and I wanted to try my hand at making them. What a great website about hammocks. My name is Frank from France. A halmmock lover for nearly 3 decades. My ain goal when I travel with my hammock is to have the less volume in my bag and the less hassles with hooks, rings, lockers etc… I made a short video to show you how simple hanging a hammock is. Less than 2 mn ! Hope you like it and don’t hesitate to comment ! video link : https://www.youtube.com/watch?v=acv2pys-cME Forget about the french speaking ! Looking is enough. Yes! Vast improvement over the Slap Straps. I just purchased the Atlas Straps and used them this week for an overnight hang. No stretch whatsoever and I’m 280 lbs. Can whoopie slings or a continuous loop be used in conjunction with the Atlas Straps (to negate the carabiners)? You could use soft shackle carabiners or a toggle. If you want to reduce weight you might go with a simple strap without the daisy chain loops and then tie a slippery Becket Hitch. Easy to tie and untie. Hey Derek I was inspired by this site and just bought hammocks for my whole family of four. I like how easy it looks to set up these straps, I can’t wait to get out and do some hammock camping! My question is about the straps, I’m looking at both the Atlas straps as well as the Python straps, and it seems they both get very good reviews by you. Which do you recommend? I am about 240 lbs so I don’t want anything that will stretch (Atlas looks good for that), but I also want the slimmest lightest gear to save room in my pack (Python looks a tad slimmer). Nick, thanks for visiting and I wish you the best with your family adventure! I recently took my family to Goblin Valley where we did a fun family hammock hang. You shouldn’t have any issues with stretch with either strap. If you’re looking for the slimmest and lightest, the Python straps are going to give you an edge. There is one other company that you might keep your eye on for high-quality yet reasonably priced hammock gear: Yukon Outfitters. Their made-in-the-USA products are a surprising yet welcome entrant in the space. If you are trying to outfit a family, I wouldn’t hesitate. Their Walkabout Rain Fly, for example, is perfect for hammocks, and it packs small and is light! I have one for my son who is a Boy Scout. Awesome, thanks for the quick reply. I think I’ll go with the Python straps, you never can be too light or too compact! For my birthday this year i got atlas straps and i have a grand trunk hammock i was wondering in i could use atlas straps with a grand trunk hammock. Ok thank you so much!! Why would I use these, and not a cheap pair of ratchet straps? Even the cheapies have a 500lb load capacity (each), and they’re much more adjustable. Is there something special about these straps that I’m missing? The main element you may be missing is the simple daisy chain loops? Maybe the weight? Ratchet straps are super useful for cargo, but it’s not as easy to understand for novice people, and the weight of the ratchets is a LOT more than most folks need. The purpose of a ratchet is to create a taut connection, which is also a little counter-intuitive to how a hammock should be hung, and I would not recommend hanging a hammock tight.